Those markings on the sidewalls of tires might seem like the kinds of scratches only a calculus major could understand, but they’re really not that complicated. Here’s a look at the various markings and what they mean. 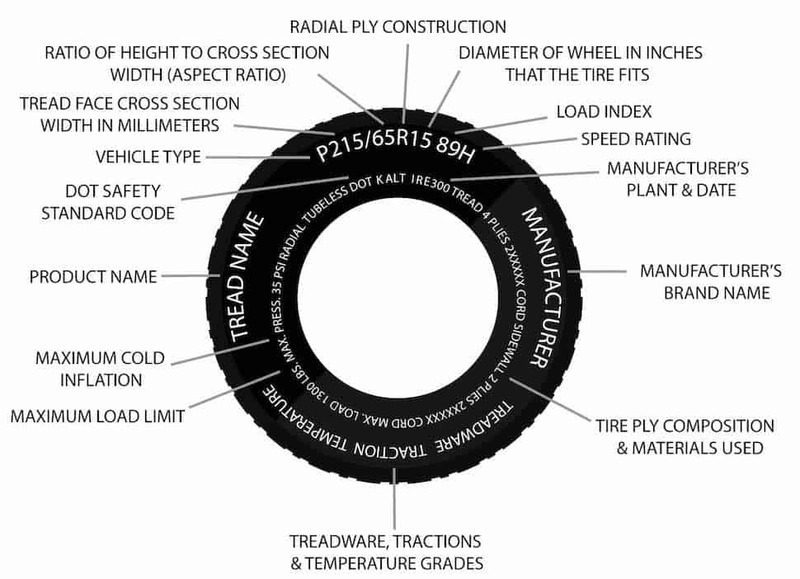 What do Tire Sizes Mean Exactly? Here’s a common tire size: P225/65R17. The first letter, P, means it’s a passenger car tire. Tires for a pickup or some sport-utility vehicles might start or end in LT, meaning light truck. The 225 is the width of the tire in millimetres from sidewall to sidewall. The 65 refers to the ratio between the width and height of the sidewall. In this case, the sidewall is 65 per cent of the width, or 65 per cent of 225, or 146.25 millimetres. The R means radial, as in the style of construction, while the 17 means it rides on wheels with 17-inch diameters. These numbers are important to get right when looking for tires, as a P225/55R17 tire will have a different overall diameter and throw off your speedometer. As well, tires with lower aspect ratios will both ride rougher and increase the risk of wheel damage, as there is less sidewall to absorb bumps. As an example of a performance tire size, the Porsche 911 Turbo S Coupe takes 305/30R20 on the rear, or 305 mm wide, 30 per cent aspect ratio (sidewalls are only 91.5 mm high), on 20 inch wheels. Here’s another great piece on how to read your tire from the team at Edmunds. This number can range from 75 to up 120, and those and each number in between correspond to the maximum load a tire can support when properly inflated. Each increase by one in the tire load rating (from 100 to 101, for instance) increases the load capacity by 55 pounds (almost 25 kilograms). Tires are under extreme amounts of force, not only in holding up the vehicle above but, at speed, there are also extreme amounts of centripetal and centrifugal force acting on the tires. The centripetal force refers to the forces acting inline with the arc of rotation of the tire, while centrifugal force refers to the forces pushing away from the centre of the tire. Both forces are central to a tire’s speed rating: too weak a tire could tear itself apart at too great a speed. 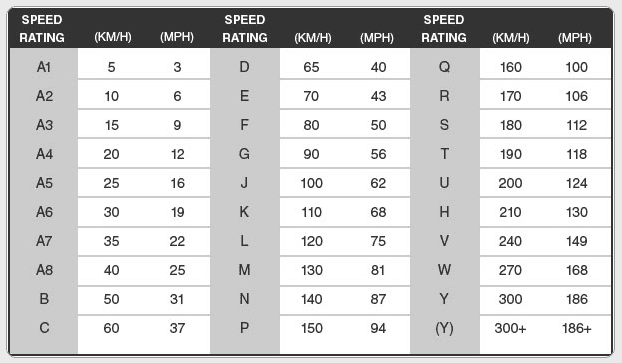 The tire speed rating is a letter, ranging — non-linearly — from Q to ZR. Q rated tires specify a maximum 99 miles per hour. Fortunately, we don’t see too many of those in passenger-car applications. More likely is H, or 130 miles per hour. V rating means 149 miles per hour while Y equals 186 miles per hour. What you do need to know, however, is that you shouldn’t mess around with speed ratings. If your car has a V-rated tire, don’t replace it with an H-rated tire. Above 186, it gets a bit more complex, with ZR usually applied to such tires, but the ZR has to be accompanied with the Y. These tires typically have ratings above 186 miles per hour (300 km/h). The other factor that speaks to speed rating is the tire’s tread, in its ability to bring the car to a halt from such high speeds. Since these higher speeds are typically only seen on racetracks, even on Germany’s Autobahn, they’re beyond the scope of a consumer publication. M&S stands for mud and snow, but don’t be fooled into thinking that means such tires are winter tires. They lack the softer rubber and multiple grooves (called sipes) that turn tires from hockey pucks to usable traction devices in winter. Only tires bearing a symbol showing a snowflake on a mountain are actually winter tires. You might also want to know how current your tire is, and there’s a code for that, too. Look for four numbers grouped together. For example, 4617 means the tire was built in the 46th week of 2017.